The latest addition to Alex Dowsett’s Canyon stable is ‘a thing of beauty’ according to the Essex-based rider. His new Speedmax WHR, a time-trial specific frame, is a rework of his standard, Movistar-supplied road TT bike, the Speedmax CF. The main modification to make this frame track friendly is a change to the rear dropout, fairings to cover brake mounts with a strip-down of brakes, and the removal of all gears bar a solitary single fixed. 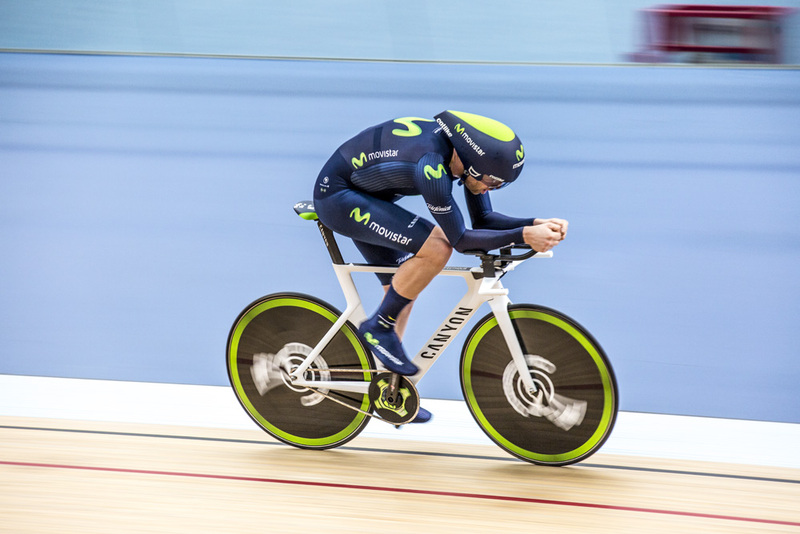 The bike has been designed for stable high speed handling, with a 73.25 degree headtube, comparatively long seatstays and wheelbase and a low bottom bracket, ensuring that Dowsett can follow an optimal line around the track. 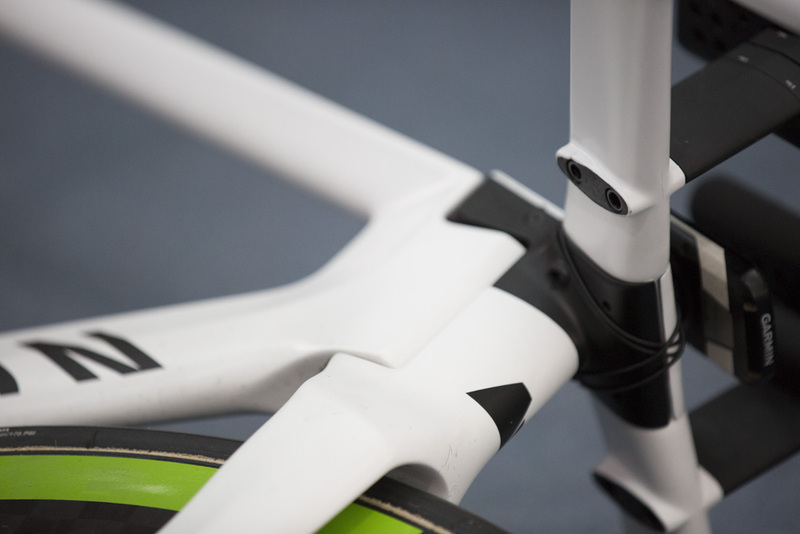 The rear triangle has had to be redesigned for horizontal dropouts and 120mm track axle width. All holes and drillings in the frame and bars, such as in the frame for brakes and the bars for cabling have been sealed to avoid drag. Dowsett will use modified Canyon Speedmax flat bars and Speedmax L-bend extensions wrapped with Lizard Skins bar tape. Even the bar ends are bullet-shaped to reduce drag. He will sit on a Fizik Antares VS saddle atop the Speedmax aero seatpost that completes what is certainly a unique-looking machine. Dowsett has been training on the much loved but out-dated Campagnolo Ghibli discs. 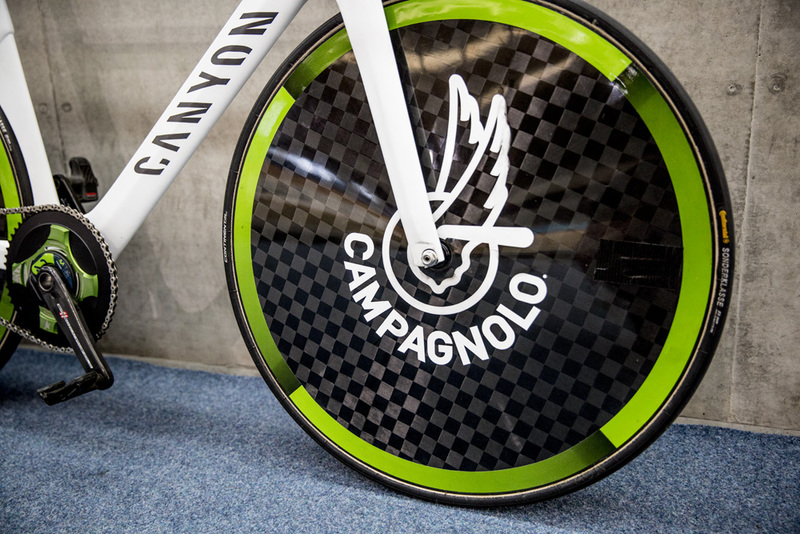 These wheels are steeped in history and it wouldn’t be the first time they’ve tasted Hour Record glory. Most famously they were used by Miguel Indurain in 1994, who went on to set the record in a distance of 53.040km. The new hour attempt has given Campag the excuse to update its wheelset (long overdue) and so on the day, Dowsett will be using a new set of Campag disc wheels that we hear will also be widely available to buy. 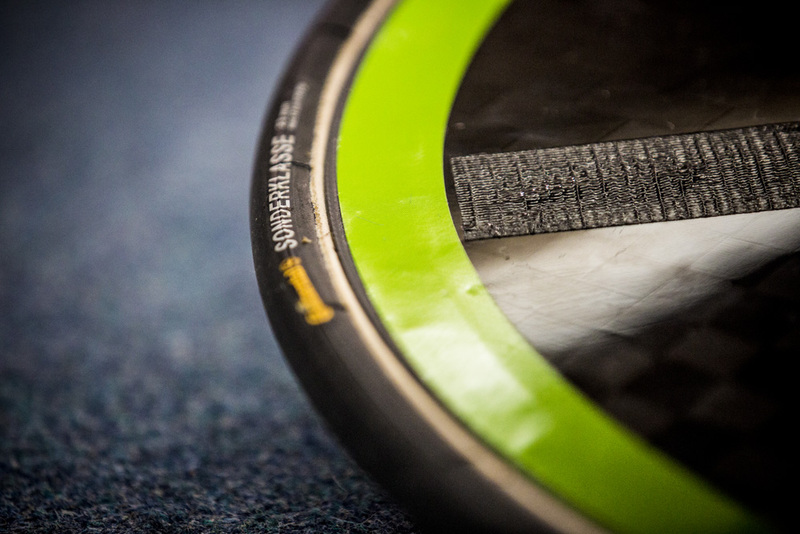 We were lucky enough to catch Dowsett during training last week and got a close up of the green-stickered wheelset. These are rumored to be laterally very stiff but weighing oh so slightly heavier than the Lightweight front and rear disc alternatives. These will be paired with Continental Sonderklass tyres, again an update from the Podium TTs he has been using in training. 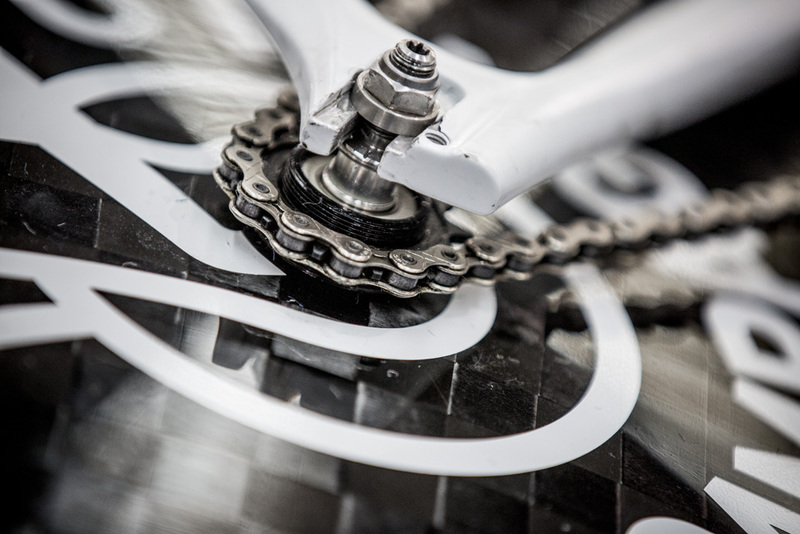 As Movistar’s gear provider, Campag will supply its new Pista chainset for the attempt. 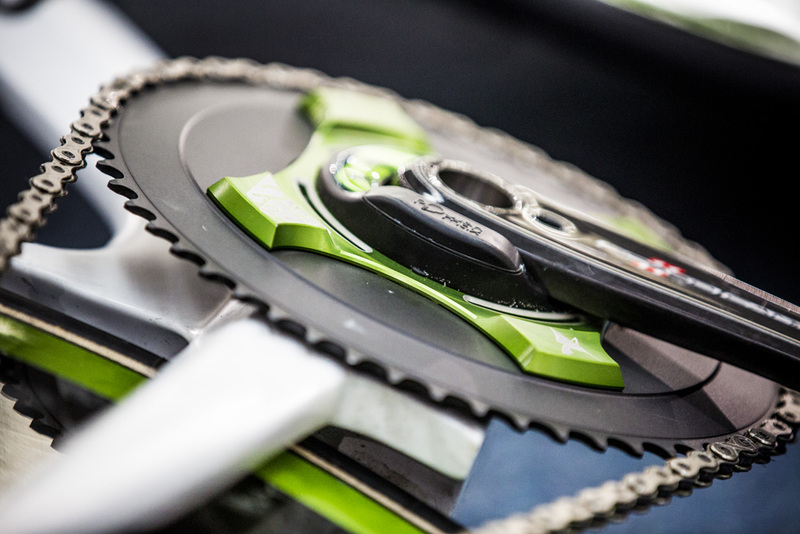 The new chainset can be fitted with strengthened 54, 55 or 56 tooth chainrings, so Dowsett may be running a lower gear than would have been provided by the 57 tooth ring which we had anticipated – the publicity photos show a 54 – depending on his choice of rear sprocket. We can see in the pictures that Dowsett will run a set of road cranks with the specially adapted bottom bracket and uniquely built track chain ring to allow for the most optimal chain line to make everything run as efficiently as possible. 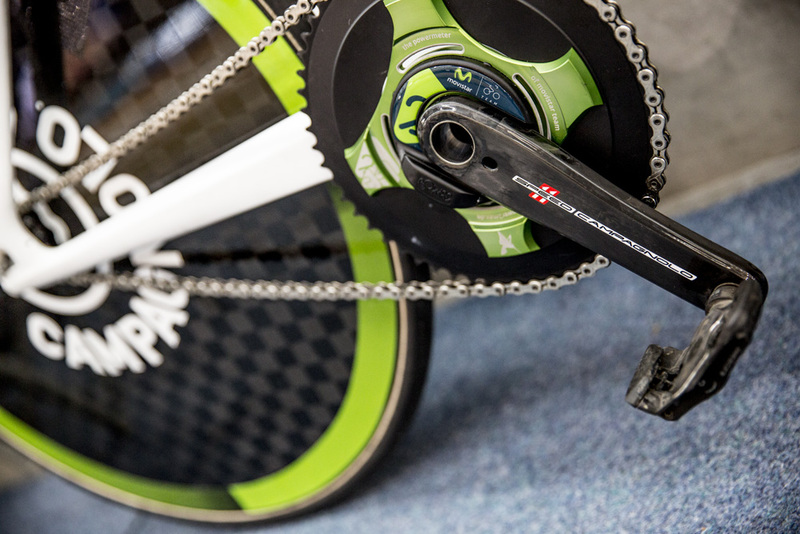 The chainset is also fitted with a Power2Max power meter, although this will be for recording purposes only as Dowsett is not allowed to see his power during the attempt itself. The pedals are a pair of Look Keo Blades, and the track chain coming from KMC. With the attempt taking place in Manchester on Saturday, we hope that this unique machine will deliver another British rider to the World Hour Record. Everything covered. Dowsett is all set ahead of his attempt.